Today is the last day of the retreat and we all have to go home to our normal lives. Sigh! This retreat has been such a fantastic experience and I have learned so much that I hope to share with you all over time. In this post I do want to share with you more pictures of the retreat and more tips. Melanie and Marge are getting advice on a project. My most favorite technique that I learned this week was from Lynette on how to make the most amazing clouds on a scene. In this picture, you can see the finished clouds. The upper two rows are tapped in place with the edge of a felt pad and for the lower row I streaked the clouds and then tapped on top. How did I accomplish this you ask? We used Dr PH Martin Bleed Proof Opaque White Paint. I think you can use any water based acrylic opaque white paint from art stores. We applied the paint using cotton balls, que tips and Ranger felt pads. First lay down a coating of color and then tap in very small amounts of the paint with your chosen applicator. Keep tapping or streaking until you have the desired effect. Another technique that is new to me is the use of a hot iron and colored wax. The colors you use and the method of holding the iron in certain directions and applying pressure in just the right way will result in the most amazing looking scenes. I learned this one from Barb. 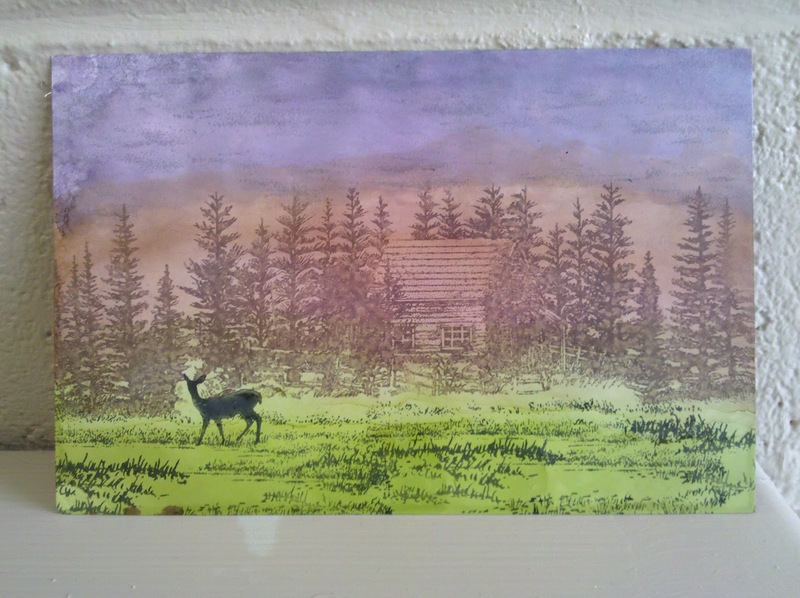 This scene was made by stamping the dolphins on glossy paper and then working magic with the wax and iron. 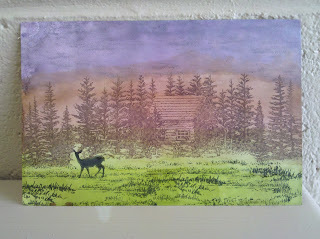 Finally, I have a scene from Bev T (who taught me how to use the brayer this week) to enter into the Silhouette challenge. Normally we only accept finished projects that have been made into a card or other type of project, but Bev is here with me at the retreat and won't be able to finish the card until she gets home and then it will be too late. So she has promised to finish it this weekend. That's all for today. I'll be back tomorrow with our Silhouette challenge winner and top 3 pics.